Our older children are frequently included in The Singing Christmas Tree. Children (Fours through 6th Grade) participate in morning worship 2-3 times each year. 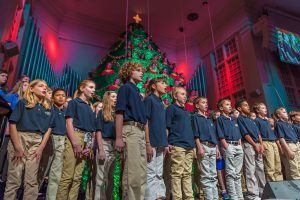 Click here for our Children’s Choir brochure and full schedule. Youth Choir is for grades 7-12. They rehearse each Sunday, 5:00—6:10 p.m. in the Music Suite, Room B2040. This group sings for our morning worship services several times each year, participates in special projects such as The Singing Christmas Tree, attends state and national choral festivals, and takes an annual mini-tour each spring. Click here for the full schedule and brochure. The Sanctuary Choir meets every Wednesday, 6:45-8:15 p.m. in the Music Suite, Room B2040. No audition required. This group is primarily responsible for leading in worship each Sunday at 11:00 a.m. The Singing Christmas Tree is produced each year by this choir. They are also featured regularly in concerts. 8:40 Worship Team (band, vocal, tech teams) meets every Wednesday, beginning at 6:45 p.m. This auditioned group leads in worship at the 8:40am worship gathering each Sunday in the Fellowship Hall. Contact gilesb@snydermbc.com for more information. 8:40 Worship Choir meets every Wednesday beginning at 6:45 p.m. in Rm B2007. No audition is required. This group leads monthly in our 8:40 Sunday morning worship gathering and in other worship experiences throughout the year. Contact gilesb@snydermbc.com for more information. Men’s Ensemble is a group of sixteen singers. Participation is open by audition or invitation. The ensemble performs for morning worship and special events. Rehearsals are held on Monday, 12:00 noon, in the Music Suite, Rm B2040.